Hawkings, one of 10 finalists in the coveted 2015 Telstra Road To Discovery national competition has teamed up with Grammy Award winning Producer/Engineer, David Odlum (Glen Hansard, Paloma Faith, The Frames, Luka Bloom, Gemma Hayes), at the amazing Black Box Studios in France, this team have created an album with stunning melodies, thought provoking lyrics and golden layered guitar riffs. 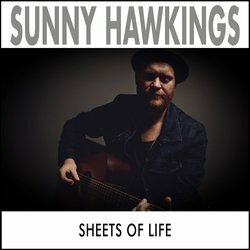 'Sheets of Life' spans indie-rock, folk, alt country and ambient instrumentals. The album's title was lifted from a lyric in one of the feature songs, 'Little Cars' used to describe the veils of emotions (love, loss, longing, joy) we encounter in our daily lives, a recurring theme throughout the album. Already receiving national rotation for his song 'Little Cars' on ABC local, his songwriting is being appreciated from all over the country at the moment. Greatest Fears is a great introduction to songwriting of Sunny Hawkings, a fast paced, high energy song with a melancholic emotion. His collaboration with David Odium (Glenn Hansard, The Frames, Paloma Faith, Gemma Hayes) is evident in this track with some amazing layered guitars and high production.